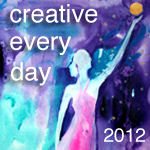 Ways to share: Once you've signed up, you can leave a comment on this post and/or use the "Mr. Linky" widget below to link to a blog post(s) about your creative activities during the days of 3/26/12 - 4/1/12. Theme: The (totally optional) theme for March is mixed-media which you can read more about here. This week’s post explores the archetype of the Crone, who monitors the territory of wisdom, inner knowing, but also change, loss and even death. This week I am both challenged and comforted by her. I am back after a good break and ready to create more. This week I’ll be finishing up 3 paintings which I need to turn in for a show by April 3rd, since two are in oils, I’ll be finishing those in the next day or two and starting on the third which is an encaustic painting. I’ve been taking some photos as I work and will post them later this week. I switched my art workshop survey to SurveyMonkey because I liked the format and tools better, but also people were having trouble with being able to view and take the prior poll. I’m really appreciate it if anyone here would mind taking a few minutes to take the survey and give me some feedback. Just go to my Workshops page, give a quick look over, then click on the link to the survey. Thanks and have a creative week! I have been working with dry mixed media for a while, working with vine charcoal and oil pastel. This week I will add watercolor pencils into the mix. Mixed Media March has been a very productive month. Finally my work is becoming a cohesive series. I am about to take an on-line poetry course and felt like jotting a poem this morning. Happy Monday everyone. I took a lot of tree photos last week as fodder for new work. I used one as the postcard for the postcard challenge. Stop by and take a peek. I am enjoying Mixed Media March! I’m having so much fun. The other CED artworks are very inspiring. I did my cherry blossoms picture this weekend, and I want to complete at least two more mixed media pieces this week. I’ve been faithfully creating… if not every day then at least many days a week. But I’m finding it incredibly hard to get the oomph to take photos, upload and edit them and then write an actual post on my blog. Today is the first real post in almost 3 months! I’m really hoping that will change as spring comes and I move out of the winter blahs. Has anyone else been finding they retreat, withdraw or hibernate more in the winter? I’m in Ontario, in Canada, and we had the warmest winter in my life but I still ‘turtled’. Not too much going on “In My Studio,” but plenty of things getting done. Working on some creative “pass it forward” projects and Word Art Wednesday while enjoying the new life that comes with spring! Thankful for all the artistic inspiration found here! This has been such a motivator for me to honor my intention to try new techniques each week! I am always delighted to see new habits form from the prompts you provide, Leah! Decay, entropy, all symbolized by rust. Check it out! Better late than never, right!! I was away all of last week playing with family so I am still feeling creatively a little out of sorts this week. But a new post went up today and the sea is still by my side I have been giving private painting lessons at the request of another artist and this has been a real source of affirmation. I had know idea I took so much of my learning for granted!!! Well the best of the last week of March everyone and here we are well into spring! Another Creative Day: I think the Spring thing is good for me. I finally explored Collage: any comments would be so gratefully accepted. I had a fun month! Tried to keep a somewhat consistent narrative in the first half to tie in with a show, then let that go a little. Kept the figure as a consistent element.